Windows XP Backup is still a popular backup job due to worldwide expansion of Microsoft Windows XP. As the operating system almost lacks internal backup tools, the third-party solutions are up to come. The perfect Windows XP system backup utility, like Handy Backup, has a lot of functions and features required every day. Handy Backup is fully compatible XP backup software, being proof-tested over time for any complex task existed for backing up and restoring data. It is a completely reliable Windows XP backup tool. Software contains a wide selection of presets and plug-ins automating different backup Windows XP tasks such as automation of backing up and restoring photos, E-mails, databases, system registry and entire system disk image. 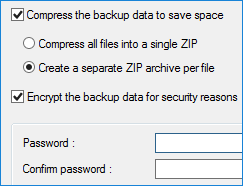 Saved data can be moved a backup folder to any other computer or to different OS without any change in data format. It can be also viewed “as is” when stored into backup, requiring no special software for viewing. The simplest way to perform backup of Windows XP files is to get a brand shiny new Standard edition of the software. Free 30-days trial version! Note: Handy Backup supports backup Windows XP until the version 7.7.9. If you need for the Windows XP backup, download and install Handy Backup 7.7.9. Flexible setup of backup tasks. The utility can perform full, incremental or differential backup. It also can provide automatic backup by file types using masks, move a system to recovery using an image previously saved and more. Managing schedule time. 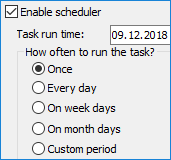 For any task performed for XP backup, user can set up a recurring period measured on a regular basis from minutes to months. Other programs can be executed before or after the particular task, too. Security measures. All data moved to safety can be encrypted by BlowFish-type modified algorithm, compressed using ZIP and sent to the destination by some different methods including protected network connections and physically moving the data storing device. Controlling any task. Windows XP backup tasks always inform users about software activity and give them important information about task results as well. E-mail notification and extended logging are examples of these activity-controlling methods. Wide choice of storage types. Handy Backup allows storing your Windows XP backup information to many places such as hard drives (including external USB disks), FTP servers, private and commercial clouds and other backup storages. Compatibility and upgrading. The list of standalone-type Windows operating systems supported by Handy Backup includes Windows 10/8.1/8/7/Vista, as well as server-oriented system such as Windows Server 2008(R2)/2012(R2)/2016. It has also native supporting for some Linux distros, provided by network-oriented editions of Handy Backup only. 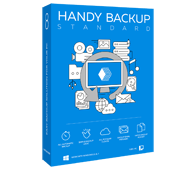 Download a newest version of Handy Backup and try it as Windows 10, 8, 7 or Vista backup software – a 30-day free trial! Download Handy Backup 7.7.9 for Windows XP!